VEPTR progress - Photo on left was taken Aug. 2001 - just before VEPTR implant surgery (age 6yrs old). Photo in the middle was taken Mar. 2005 - 4 years of progress. Photo on the right was taken Mar. 2007. Lookin' good! Incisions heal well and everything. 10-13-08... Expansion of both rods. The doc was slightly surprised he was ready so soon after the latest expansion (less than 6 months) but he got a good expansion on both rods. Minor complication this time - the chestwall rod appears to have disturbed a nerve (bundle - the intercostal nerves in that area) which meams Braydon had significant rib pain under his arm and around to his sternum. He said it felt like his ribs were broken. With good meds to control the nerve pain, he is again doing well. 5-5-08... Expansion surgery of both rods. The hybrid rod had an odd thing occur. The bottom attachment site (where the sleeve is anchored to the attachment on the L1 vert) had a screw come loose. When they tried to extract the rod, it slipped quite a ways, and was loose. They knew it wasn't normal (he didn't need and expansion THAT bad). The did an xray to make sure there wasn't more than "just" the screw issue. The screw was screwed in tightly again, and the expansion went well. 12-27-07... Routine VEPTR expansion of hybrid rod only. Chestwall rod did not need expanding! Woohoo. 5-31-07...11th expansion surgery. The rib-to-rib chestwall rod had migrated through the bottom two ribs it was originally attached to. 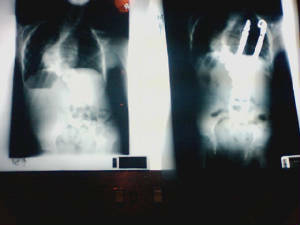 This surgery was to re-attach that chestwall device and expand it and the spine hybrid rod. They did quite a bit of stretching and manipulating to get the chestwall rod reattached, but it was a success! The rod is not nearly as prominent on Braydon's back as it has been for a couple of years. He did have some significant chest pain from the reattachment/expansion. Inflammed cartilage. Took about 3 weeks to be off pain meds this time, but he did it. He's doing great. No back pain, no headaches, enjoying being bored all summer. Next issue - Sept. 4, leg surgery (de-rotate the right tibia and correct the knock-knee position of the right knee). Will update after surgery (by Dr. Peter Stevens at PCMC). Overdue update 3-16-07... Braydon had surgery on Dec. 13, 2006 to re-release a tethered spinal cord. The surgeon told us that there was very little scar tissue, and that there wasn't much to repair. However, apparently they repaired enough because Braydon has been doing very well since! His back pain is gone, his leg pain is gone, and most of all (drumroll please...) his bowels are working on their own! He has been laxative-free since mid-January. First time since age 5. The new thing he's dealing with now is that his rib-to-rib VEPTR device has migrated completely through the bottom ribs it was attached to (pic of xray on the right). 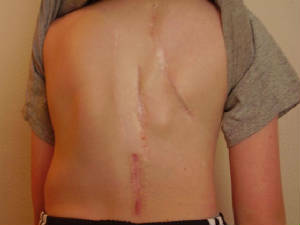 On May 31, 2007 (his 12th birthday) he will have his next expansion surgery and the rib-to-rib device will be re-seated to stabilize it again. Hopefully once it is re-seated, the rod won't be so prominent on his back. It isn't causing pain. The only issue is that his skin is very sensitive over that part of the device. 10-9-06... 10th expansion. Braydon's chestwall device appears to be migrating through the bottom ribs. However, when they checked to see if it was a problem, they found that the rod is still very stable and they were able to get a full 1cm expansion of the chestwall and hybrid devices both. Braydon did great. He felt ready to go home early evening, but we stayed overnight. 3-13-06... 9th expansion. 2nd exchange of both devices. They were able to get a good expansion of both the chestwall and hybrid, replacing both devices. Braydon went a full year between expansions of the chestwall. Maybe not a good idea because a few months ago he began having breathing issues. We saw the pulminologist in February. He said Braydon has "asthma-like" lungs. His lung function is stable at 47% (or 43%, near the 50% range). I believe Braydon's lung function is a direct result of his chestwall device being expanded or not. Recovery was difficult. Didn't get started with good pain management, had wrong dose of meds, etc. Set his recovery back 2 weeks. UGH. Good news is Braydon has added to his titanium collection. He now has quite a collection of locking clips and sleeves (expansion pieces). 3-21-05... Braydon's 7th VEPTR expansion. The surgeon expanded both devices to almost the very end. A one-notch expansion. Braydon's spine and ribs are stiff. We will try to go longer between surgeries to allow him to grow into his expansion (right shoulder seems almost overexpanded). This surgery was the smoothest recovery yet. Great pain management plan set before surgery. Great anest. who gave anti-nausea meds. Great experience overall. 9-2-04... Braydon's expansion surgery went well. Both rods were expanded one notch. Both rods are near their full expansion, again, which means in the spring, he will be evaluated to see if he needs both rods exchanged already. We'll see. Braydon also had 4 teeth extracted (for future orthodontic work) and had injections in his keloid scar on the back of his ankle from March's ankle/foot surgery. Kill a few birds with one anesthesia. 3-1-04... Surgery today was to exchange the sleeve of the chestwall rod and to expand the hybrid rod. The chestwall replacement went well. They didn't have to make a larger incision (typically they do). The hybrid was expanded one good "click". Braydon also had surgery on his right ankle. He is wearing a green cast which comes off on April 6. Recovery has been great! I'm so proud of him! 9-22-03... Braydon had surgery today to exchange the sleeve of his hybrid rod. They removed the smaller sleeve (size 7) and replaced it with a longer sleeve (size 10). They were also able to expand the chestwall rod to the very end, which means in six months he will have an exchange surgery to replace the sleeve of the chestwall rod. Braydon's recovery has been very smooth - no weird or unexplainable pains this time - woo-hoo! Braydon's lung function tests show that he has improved from 51% lung capacity/function to 71%. A significant improvement. 10-25-02... The second expansion was done October 25, 2002 in Salt Lake City. The hospital here (Primary Children's Medical Center) received official approval to begin impants and expansions on May 1, 2002. Dr. Campbell came to SLE for Braydon's expansion today. They expanded 2 notches (1cm) on each rod. The next expansion will involved a replacement of the hybrid (spine stabilization) rod. Dr. Campbell will come back for that surgery as well. The next expansion will be March 2003. 3-26-02... Braydon had his first expansion surgery March 26, 2002 in San Antonio. They were able to expand both rods 2 notches (about 1cm each). His right lung improved another 15% in size and capacity. We are very pleased with his progress. Braydon stayed 6 days in the hospital after his expansion because of some GI problems. Ugh. 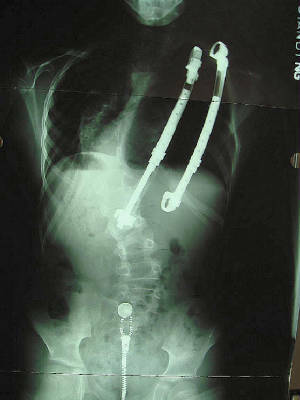 Feb 2007 - Braydon's back after his 10th VEPTR expansion, and after his 2nd tethered cord release. March 2007 - You can see that the rib-to-rib VEPTR has migrated through the ribs at the bottom attachment site (click on image for larger view). The device will be re-seated (repositioned and stabilized) during the next regularly scheduled expansion surgery May 31, 2007. Click on the photo for a full-sized view. These are before and after xrays of Braydon's spine. They are looking at the back of Braydon, with his right side to the right. The clarity isn't good, but you can get a general idea of the improvement made during surgery. For example, you can't see the two places where they cut apart the ribs on the right side (2 full inches), but you CAN see that the lungs are now the same size. You can also see that the lumbar spine no longer bends to the right before dropping into the pelvis - it now comes almost straight into the pelvis. You can also see that his body doesn't angle to the right - he is now much more straight. And, his hips are now level. The rod on the right is placed to keep the chest expanded (under the shoulderblade). The other rod is attached to a top rib near the shoulderblade and at the bottom to a vertebrae. 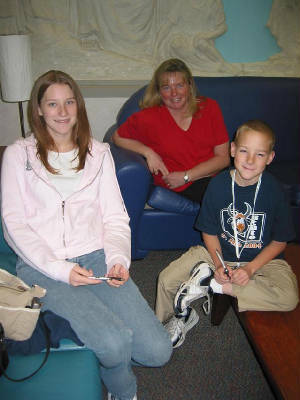 Kara, Carmell and Braydon - October 25, 2004. PCMC hosted a VEPTR/TRP surgeon training session. Braydon had done very well until we noticed that his little body just didn't seem right, beginning in the spring of 2000. We started asking the orthopedist about the changes. He began having problems with bladder pain, as well as chest pain (which we attributed to stomach reflux). He also showed signs of slowing down and not having as much energy as before. His spine xray done in February 2000 showed that his lower compensatory curve is getting worse. This lower curve is causing his body to not be well aligned anymore (his head and his pelvis are not in balance). In January 2001, we took Braydon to San Antonio Texas for an evaluation to see if he qualified as a candidate for the Titanium Rib Project/VEPTR device. At the end of January, we received the official word that Braydon was accepted as a participant in the TRP study. His implant surgery was scheduled for August 14, 2001. The goal of this Titanium Rib Project is two-fold for Braydon. 1. They will separate the 5 ribs on his right side that have fused together over time because of the lack of space to grow independently. This will give him more chest capacity and in-turn, give his right lung more room to grow and function, hopefully to prevent serious lung function compromise. 2. They will also implant a longer rod to support his spine. These rods are literally internal braces to keep his body from getting worse. We are hoping to get some degree of correction from the initial implant, however, if the correction is not enough to re-align his body properly, they will do a second implant (a third rod) on the left side to stop the progression of the compensatory curve, at a later date.